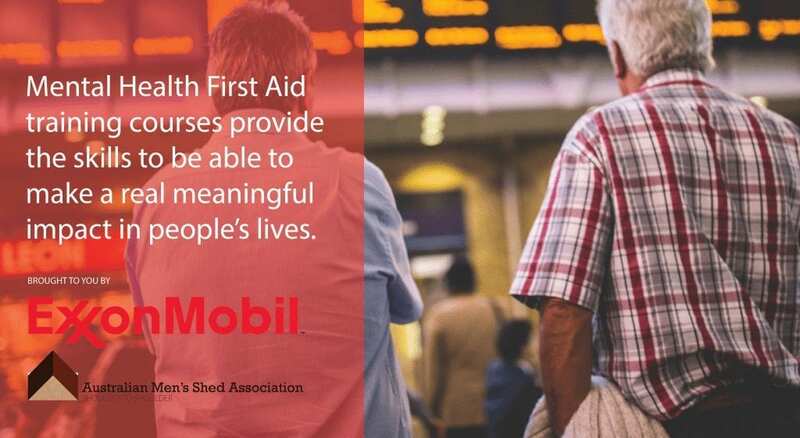 Thanks to ExxonMobil, shedders in Victoria are invited to participate in a 2-day Mental Health First Aid course in Sale or Melbourne. Date & venue for Melbourne-based course to be advised. Thanks to our partner ExxonMobil, this course is free for shedders from AMSA member Men’s Sheds. Cost for shedders from non-member sheds is $100 per participant. This course is open to shedders only. Contact AMSA on 1300 550 009 or amsa@mensshed.net for enquiries or to register your spot.